The T-55AM-1 is a gift Rank VI Soviet medium tank with a battle rating of 8.7 (AB/RB/SB). It was introduced in Update 1.81 "The Valkyries". The T-55, which this tank was based upon, used exclusively rolled homogeneous armour, which proved to useless against advanced chemical warheads. 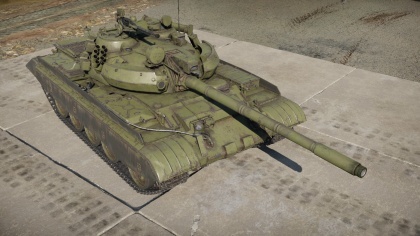 The Soviet Union, in an attempt to modernize and extend the service life of the T-55, conceived the AM-1 upgrade kit for the tank. The upgrade kit consists bolted-on blocks of metal-polymer plates, which are essentially plates of metal sandwiching polymer fillings. This solution was cheap and easy to implement, though its effectiveness was debatable. Compared to the original T-55A, the armour protection was greatly improved, but still prove to be insufficient against certain weapons. The turret cheeks are fitted with the add-on metal-polymer blocks, which grants immunity to every HEAT warhead in-game except the HOT missiles. The Leopard's 120mm HEAT-FS occasionally penetrates the cheeks, and in that case, very minimal damage is caused. The turret armour against APDS is highly effective, given that the projectile impacts the add-on armour. However, the armour is mostly useless against APFSDS, and in case of penetration, will cause extensive damage. The add-on armour on the upper front plate is somewhat effective as it can nullify HEAT warheads with less than 450mm penetration. Most APFSDS will seamlessly penetrate the hull. Most APDS will bounce. Do note that the gun breach area is very poorly protected by some 200mm of cast homogeneous armour, making its protection worth absolutely useless against everything. So do try to angle your turret by facing your cheeks. When doing so, use the right side of your turret to "catch" rounds, as even if it penetrates, only your loader will be knocked out, so no big deal. Also note that the add-on armor block can be blown off your tank. For example, HOT missiles will have very high chance of taking off armor, and direct hit from artillery shell (assuming it hits the armor and doesn't destroy you) will take off the armor. In regards to ammo storage, your ready rack is stored within your fuel tank. This wet ammo storage will prevent ammo detonation from HEAT, but a well placed APFSDS will nonetheless cause ammo cook-off. The mobility is only bested by the XM-1. It will out-run most, if not all, its friendlies and adversaries. Its pivoting capabilities are comparable to the very capable neutral steering system on the Leopard L/44. The tank will reach around 30-40 km/h off-road, and 10 km/h in reverse. The so-called "stabilized" gun is only operable reliably under 35km/h. The 100mm rifled gun seems like an oddity at this BR, not in its calibre or whatnot, but its unparalleled versatility. The gun can fire APDS, APFSDS, HEAT-FS, HE, APHE, ATGM and smoke. In fact, it can fire every type of munition available in-game with the exception of HESH. Though very versatile, it is quite useless as the APDS, APFSDS and HEAT-FS are terribly under-performing compared to its adversaries. The only offensive munition worth carrying is the APHE and ATGM. The APHE (APCBC) is extremely capable. It will destroy most bad guys your face with one shot, given proper shot placement and successful penetration. At this rank, most your opponents are poorly armoured, like the Leopard 1, MBT/KPz-70 and XM-1, so the 200mm penetration on the APHE will penetrate and will result in the instant destruction of your enemies. The classic method of operating Soviet post-war tanks is hull-down sniping, concealing your vulnerable hull and exposing your well-armoured turret. Although this method is highly effective at staying alive, it is somewhat boring, and sometimes not enough to secure a victory. At times, you will have to leave the comfort of your cover and advance into enemy lines, and this tank will have no problem doing so. 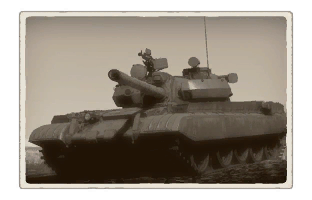 The T-55 AM-1 can not only hold a position, but also flank and advance the line (lead the charge) It is recommended to use your mobility to take up vantage points as the match begins, support your team and push out mid-late game to capture points. One of the few top rank tanks with APHE, great for one shots. Describe the history of the creation and combat usage of the ground vehicle in more detail than in the introduction. If the historical reference turns out to be too big, take it to a separate article, taking a link to an article about the vehicle and adding a block "/historical reference" (example: https://wiki.warthunder.com/Name-vehicles/historical reference) and add a link to it here using the main template. Be sure to include links to sources at the end of the article. Tank destroyers SU-57 · SU-85A · BM-8-24 · BM-13N · SU-76M (5th Guards Cavalry Corps) · SU-100Y · SU-122P · Object 120 "Taran"
This page was last edited on 20 March 2019, at 15:22.